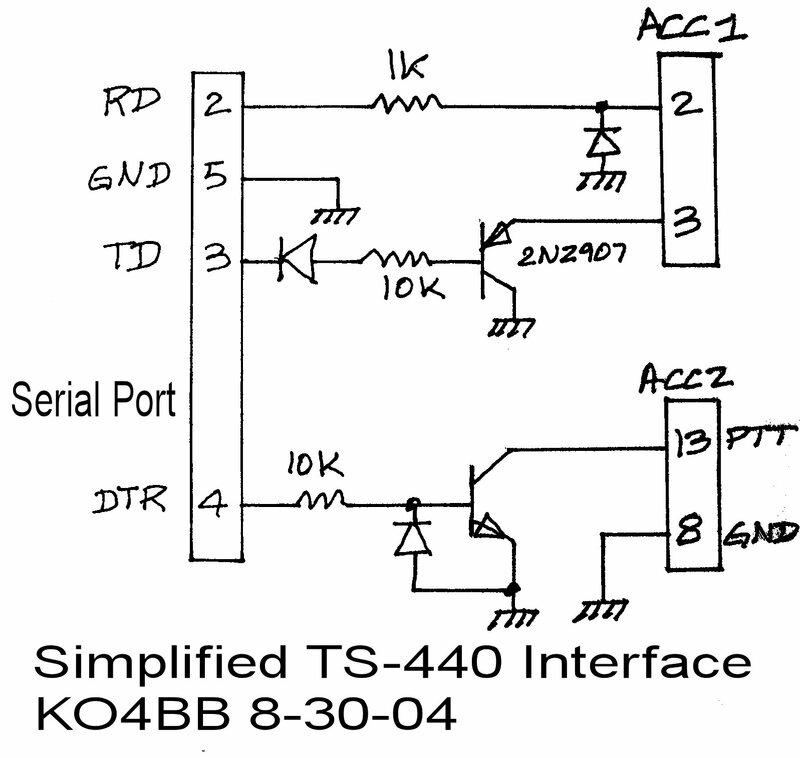 Here is the schematic of the simple interface I use between my Hitachi laptop and my Kenwood TS-440SAT. This laptop, like most new computers and also these USB-serial adapters, does not provide much current on the outputs, so it can't drive "conventional" interfaces. It has been used with N1MMLogger and Logger32 quite successfully, in addition to QSORecorder. This thing was made (I would not use the word "designed" to describe the process by which it came to being) to work without an external supply, even though the laptop only provides about +/7 V with very little current. 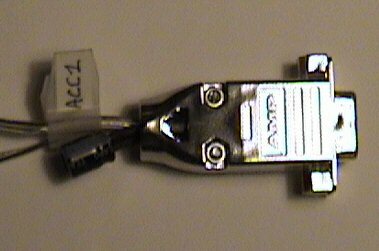 It (the interface) provides both computer control and PTT control via a single port, and is small enough to fit inside a DB-9 shell (see picture below) except for the 100uF capacitor which is outside the shell, at the end of 1" long wires. It looks like the transistor connected to TD (pin 3) is backwards, but it is not. It is used as common collector to increase the voltage across the 220 ohm resistor when the TD pin is high. The problem was that the kenwood has a small value pull-up resistor on the input, and my laptop's serial port does not have enough guts to create a low level. The 220 ohm is sufficient to create a low level, and the transistor can bring the voltage up when the TD line is high. 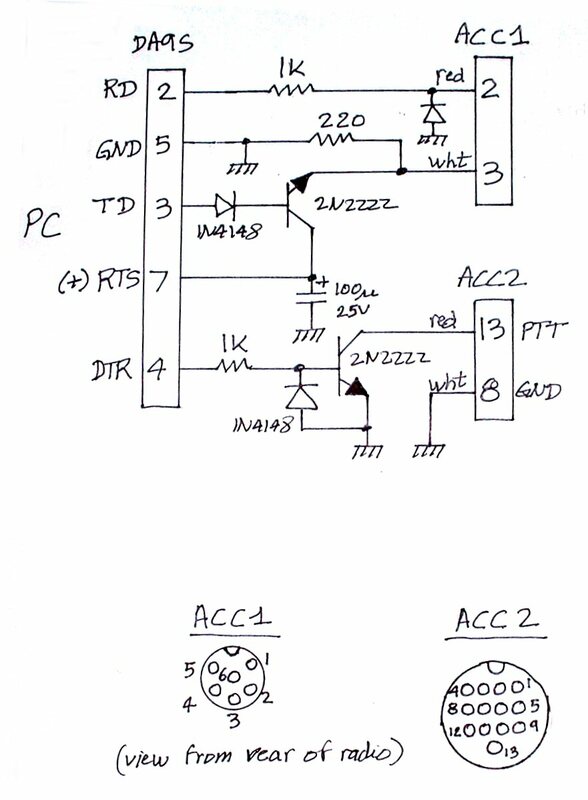 Because the TD line is mostly low, the capacitor is sufficient to create enough voltage across the 220 ohm resistor for successful communication. It would not work the other way around because the TD pin spends most of its time low. With this interface, to get serial communication (such as if you wanted to use the interface with Logging software), you must make sure the RTS pin is set permanently high. This is not necessary with QSORecorder which does not use the TD and RD signals. This new design has not been tested but should be less sensitive to RS-232 line voltages and does not require the use of either RTS or DTR, so both signals are available for PTT, CW or other functions (in the schematic below, DTR is used for PTT). Also, the large capacitor is eliminated, so it should be easier to fit the entire circuit within the connector shell. The TS-440 does not automatically mute the microphone when using the FSK mode with the rear audio connectors, so if you leave the microphone plugged into the radio, you will get shack noise superimposed on the audio from the computer's sound card. I have modified the stock Kenwood microphone to take care of this problem. The info to do that is in this page: www.ko4bb.com/ham_radio/TS-440/MicrophoneMute.php.